Just happened to catch this beauty flying over. Not sure what it is, a hawk or maybe an osprey? Last edited by csa; 05-17-2016 at 10:48 AM. These are really wonderful photos. I cannot say enough about these birds, but they are so incredibly awesome. Thanks a million for sharing. Two beautiful captures. Antonio, thank you for your kind words! I was so fortunate to see it, and get a couple of shots before it disappeared! I think it's probably a 1st-year Red-tailed Hawk of either the intermediate colour morph of the western subspecies or the dark morph of the Harlan's subspecies. The dark "comma" at the base of the primaries on the underwing coverts suggests some kind of Red-tail. What made me consider the Osprey, is the white head. Doesn't have the face mask at the eyes for the osprey, also their bellies are usually white. Fortunate shots, thanks for being at the right place/ time. Looks good BIF are the best ! Dave, thank you, I appreciate everyone taking the time to view them! Yes, although the highlighting on the head may be obscuring any dark colouration. I wish I had seen it sooner, to get more photos for an ID; but it was out of range very quickly. 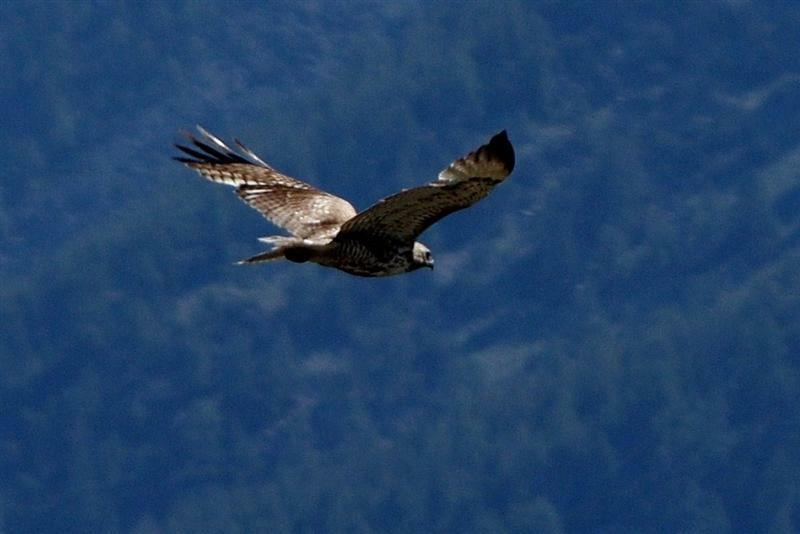 I think you might have a Ferruginous Hawk, which summer in Montana. They soar with their wings in a shallow V, as in your pictures. 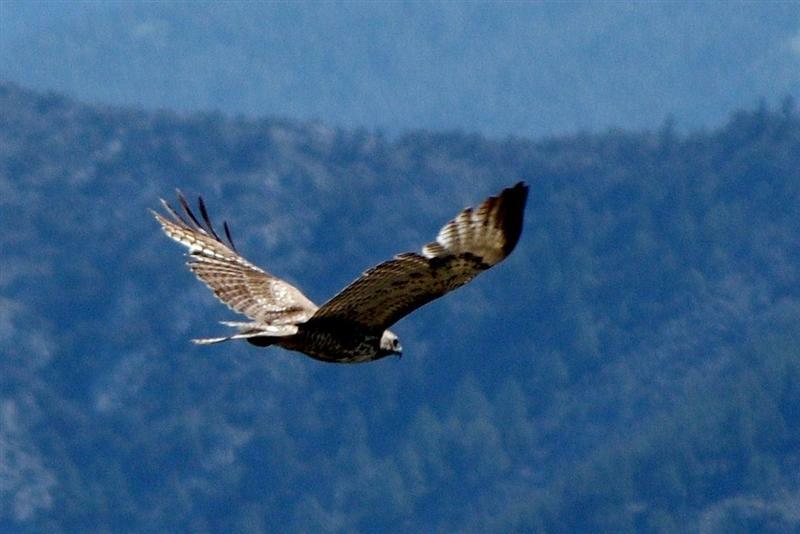 Red-tails soar with their wings straight out. Adult Ferruginouses tend to have pale heads. Well, whatever it is, you got a good shot of it Carol. This is a horrible photo, against a bright gray sky, but I think this one is definitely a Red-Tail Hawk. One problem is that the birds hardly ever read or look at the pictures in the paper and online guides! Also, there might be a lot more color variation in nature than the pictures in the guides suggest. Around here, nearly all of the redtails (which are extremely common here) have nearly totally white breasts, with only a few spots or speckles in some cases, and they have very little of the barring shown in pictures like the posted on, except under the wings and on the lower part of the body. In the guide where I looked up the ferruginous hawk, the picture of it showed much more barring underneath than the prose about that bird's appearance described, where it said they were light underneath! We have a red fox in the neighborhood that is blond, nothing like a guide pictures I have seen and nothing like other red foxes I have seen. But physical behavior, like how the bird holds its wings during soaring and gliding, has more to do with physical anatomy. To get a redwing with its wings like your pictures, it would have to be flapping its wings and both pictures would have had to have caught the wing beats at exactly the same part of the cycle. Not impossible, but what is the chance of that happening? Around here, the only large soaring bird that soars with its wings held in a V is the turkey vulture. If you see that V, even from hundreds of yards away, you know its one of them and not a redtailed hawk. But since turkey vultures are nearly solid dark brown or black, that can't be your bird; not to mention that their unfeathered heads look very un-hawklike. I don't know for certain that is is a ferruginous hawk, but it might have to be genetically mutated in a major (but successful) way to be a redtail, or how could it soar so differently from its kin? Hopefully, you can catch sight of it more times and watch its behavior more carefully and get a better look at it (& maybe more pictures!). In the long run, identifying the name might be somewhat less interesting than finding out about its habits and how or why it lives in your area. 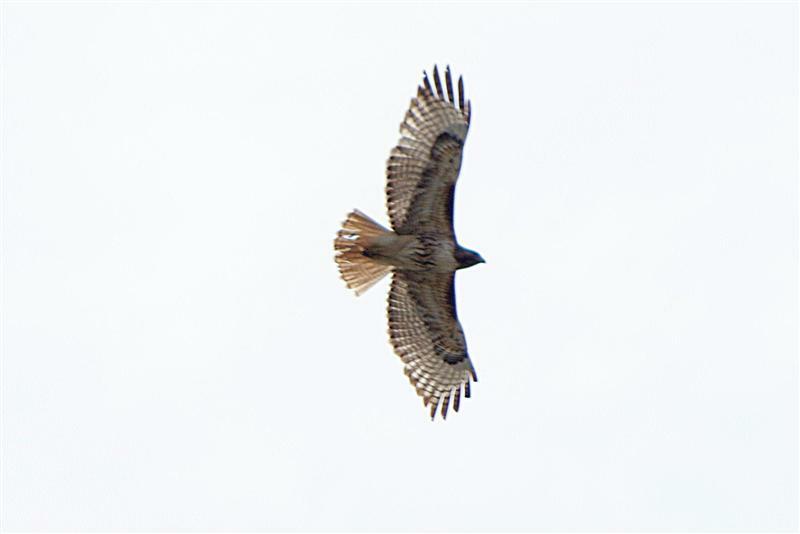 Rethinking, there could be some flight maneuver other than soaring when a redtail might hold its wings in a V.
It all got me googling. Here are a couple of links. The first mentions the V wing configuration.. The second one describes more color variations than it pictures show, and also tells how to tell it apart coloration-wise from the most similar version of the red-tailed hawk. Last edited by goatsNdonkey; 05-18-2016 at 11:08 AM.